After I had briefly blogged about JAQK Cellars over at my other blog, medley-happy, the PR/Marketing coordinator for the wine company left me a nice comment, informing me about a tasting event that would be held at Bacchus Wine Made Simple in the Upper West Side, incidentally my favorite wine store in Manhattan! It was so exciting hearing from the proprietors as well as having the opportunity to finally taste their new wines. 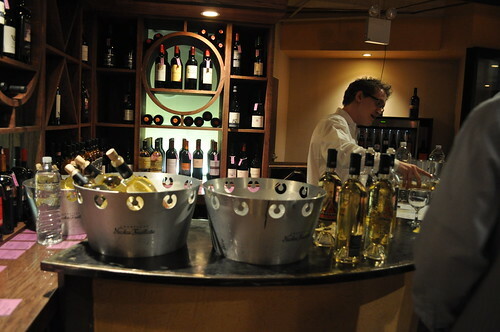 Back in early 2010, I hosted a wine tasting to celebrating my birthday with close friends over at Bacchus. It was an amazing experience--the service was very accommodating and absolutely wonderful and the knowledge of the sommelier who was helping me that day was very detailed and helpful. I did an "Old World" themed wine tasting, focused on Italian and French wines, to be paired with six different chocolates I had shopped around for and chosen myself. The sommelier did a great job with the wine pairings to the chosen chocolate, and everyone had a great time. After having such an enjoyable birthday at Bacchus, I knew the JAQK Cellars tasting would be no different. So I brought Marcus and Jess with me to the wine tasting! 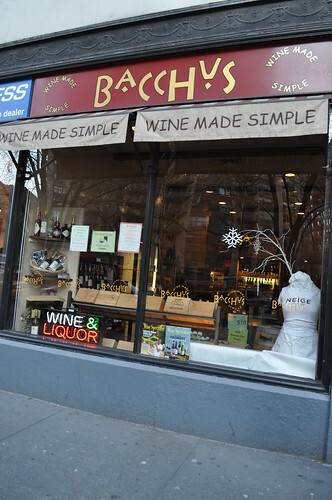 The exterior may just seem like your everyday wine shop, but Bacchus is so much more than that. With a humble storefront, Bacchus has a beautiful wine cellar-style basement (where my birthday wine tasting was held), where most of the store's wines are stored and located. There is an opening into a room down there, where store events take place. It is really a beautiful space that I hope more Manhattanites will learn to discover! 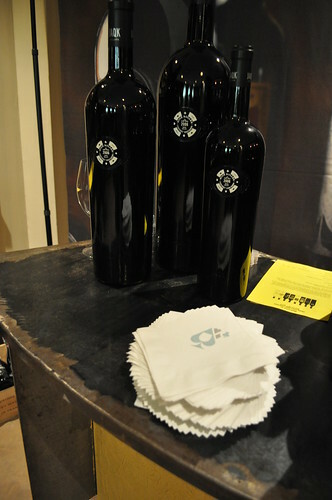 Just a brief background on JAQK Cellars--it is a relatively new wine company that officially launched in August 2010. The three founders started the company in a very unconventional way. Katie Jain and Joel Templin are both the geniuses behind the graphic design company, Hatch Design, whose clients include Apple, Coca-Cola, Starbucks, Target, Williams Sonoma, and many more. The two of them had worked on many wine brands over the years, and their favorite client, MacLean Wines, introduced them to Craig MacLean, a well-respected winemaker of many years. They learned of their shared love for fine wine, and after putting their heads together (along with the worlds of wine and graphic design), JAQK Cellars was born! While you may be wary that a beautifully designed labels on wine bottles do not necessarily dictate quality and good tasting, it is certainly not the case with JAQK Cellars. With Mr. MacLean's expertise in the wine industry and the talent of Ms. Jain and Mr. Templin of Hatch Design, they have created a solid and beautiful wine brand that is centered around great wine and passion about play (i.e., the playing card theme)! Plus, how cool is the wine company's name? J for Jack, A for Ace, Q for Queen, and K for King, naming the top players in a deck of playing cards! Here at the table of "red wines" are large liter bottles (1.5, 3, and 5) of its flagship wine, High Roller, which is a Cabernet Sauvignon from Napa Valley. I also love the napkins emblazoned with the company's cleverly designed logo! 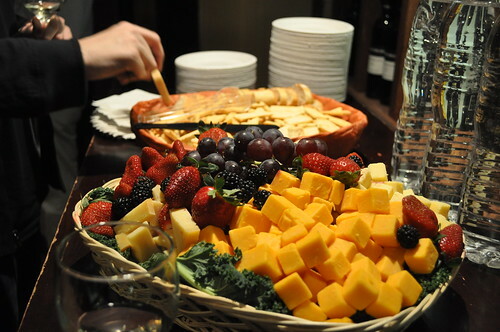 Assorted fruits, cheeses, breads, and crackers to nibble on during the tasting! 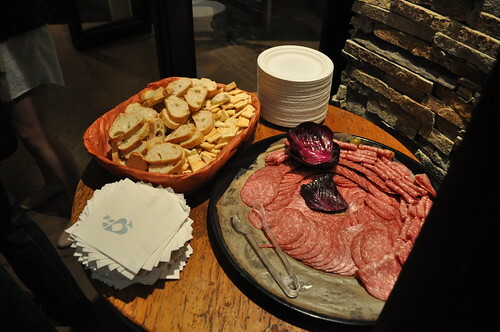 Bread with antipasta during the tasting! Here is the bar that was serving white wines by a comical and friendly French-accented bar tender (I wish I had caught his name)! 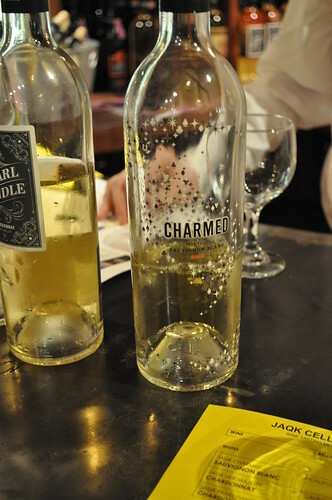 The tasting started out with Charmed, a 2008 Sauvignon Blanc from the Napa Valley. This wine is 100% barrel-fermented six months in oak. JAQK Cellars boasts this wine to go best with celebrating lucky charms and what they possess--something "unseeable" and "untouchable" they say! The three of us found this to be a very, very light wine. David Dees, the national sales manager for JAQK Cellars, whom we spoke to throughout the evening, told us this pairs very will with Thai food. This wine sells for $26.99 at Bacchus. The next white wine in the tasting was Her Majesty, a 2008 Chardonnay from the Napa Valley. The grapes used are hand-harvested and whole cluster pressed. This wine is 90% barrel fermented and 10% cold fermented in stainless steel for 10 months average in oak. The company's branding behind this is an ode to the sisters (i.e., any lady) of Fortuna, who is said to influence the "scales of fate." I love the black and red crown in the wine label design--very fitting. Anyway, we found this wine to be really buttery with a nice richness to it, preferring it to the first one. We were still feeling the wines out, so we didn't want to commit to liking anything for sure at this point. Mr. Dees shared that this goes very well with foods like fish tacos. Bacchus offers this wine for sale at $31.99. The last of the whites was Pearl Handle, another 2008 Chardonnay from the Napa Valley. The grapes are hand-harvested in the early morning and whole cluster pressed, Champagne-program style for delicacy. The wine is 100% barrel fermented for twelve months in barrels. The story behind this wine's label is quite clever. The French bartender told us that a Derringer, a pocket pistol of large caliber with a short barrel, "tamed the gambling tables" of the West, which "tended to bring out the honesty in people." 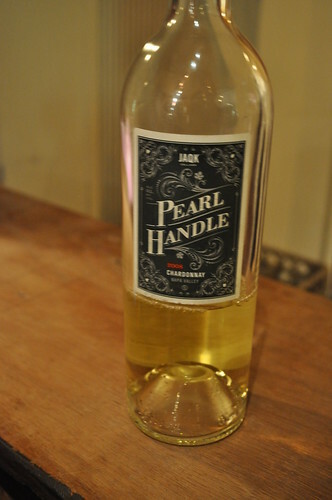 In honor of the Derringer, the wine is named Pearl Handle for the pistol's unique pearly-looking handle. We found this to be a lot smoother than the previous two whites. I pointed out that the flight of whites was like Goldilocks' dilemma in the fairytale. The third one was just right! As a side note, this wine goes well with bacon! And here's another clever tidbit--the Derringer was usually "tucked neatly in a gentleman's vest pocket or a garter of an attractive gambling house proprietress." To pay homage to the Derringer that prevents any tricks up a gentleman's sleeve, here's the cheating card! An ace of spades! I also learned on the website that there are Pearl Handle bottles with the other suits on the label reverse. So crazy! You can find yourself this awesome bottle of wine at Bacchus for $44.99. The first red (4, above) was the Bone Dance, a 2007 Merlot from the Napa Valley. The wine is hand-harvested and uses a warm fermentation extraction with minimal manipulation for ten to twenty-one day macerations for 20 months in barrels. The wine label's name pays reference to the history of throwing dice, where shamans "used to throw bones to divine the intent of the gods," thus dancing bones for a name! 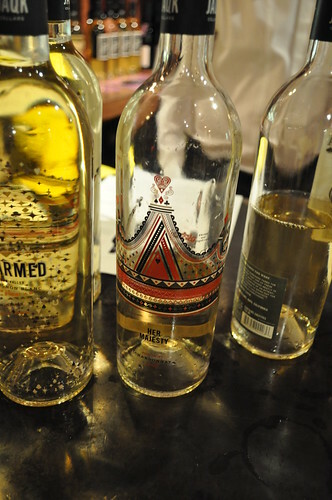 The design on the wine bottle is very intricate as well, with graphics reminiscent of the green felt on a craps table displaying the various betting possibilities. I found this wine to be filled with lots of spices, a very charismatic Merlot. Mr. Dees referred to this as the "Cowboy" of the pair of Merlots offered by JAQK Cellars and recommended pairing this with desserts such as tiramisu, crème brûlée, and sweet sauces (e.g., barbecue sauce) as well as raspberries and dark chocolate. This wine runs for $32.99 at Bacchus. The second red (5, above) was the Black Clover, another 2007 Merlot from the Napa Valley. The grapes are hand-harvest and uses small-lot fermentation, a 4-day cold soak, tailored extraction, and minimal manipulation, with a blend of maceration times ranging from fourteen to twenty-one days. The wine's name here refers to the luck "bestowed upon anyone fortunate enough to find a four-leaf clover" as it is both an indication of not only luck, but "a keen eye." 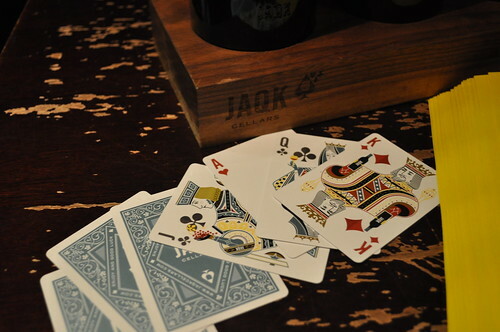 For JAQK Cellars, "these two attributes can bring great fortunes at the card table, turning a peasant (the class the clover suit originally symbolized) into royalty," and vice versa. We found this wine to be more refined than the previous Bone Dance Merlot. It was definitely smoother and more tame in character. Mr. Dees referred to this as the "Gentleman" to complement the earlier "Cowboy" Merlot and told us this pairs best with braised short ribs, for which I purchased a bottle as I attempt to make a mean braised short rib dish in the future to bid farewell to the winter! This wine goes for $49.99 at Bacchus. The next (6, above) was the Soldiers of Fortune, a 2007 Syrah from the Napa Valley. The grapes are hand-harvested, and the wine uses small-lot and partial whole berry fermentation, a three-day cold soak, fourteen-day maceration, as well as a different yeast strains for aroma and flavor development. 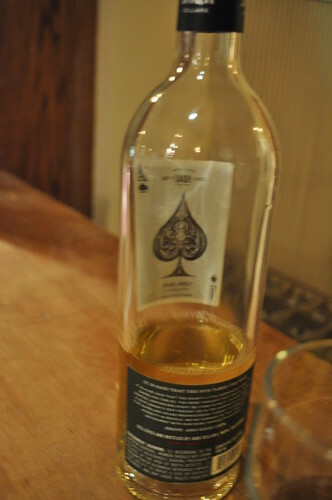 The wine's name pays tribute to the Jacks in a deck of cards, which were originally noted as "protectors of their respective realms: Ogier the Dane (Spades) served Charlemagne; La Hire (Hearts) served Charles VII of France; Hector (Diamonds) defended the city of Troy under his father, King Priam; and the peerless Lancelot (Clubs) was Camelot’s most noble knight. Today, these valets, as they were originally called, do battle on green felt, defending and seizing fortunes large and small." Love this description for the Syrah--it is so poetic! Anyway, Jess and Marcus were really feeling the wine from the start, but I had a strange initial reaction to it. At first, I was like, "Mehhh-errr-uhhh-waaa (exactly how I reacted to Jess and Marcus, haha)," but then later I was like, "Ahhh, nevermind. I do like this one." I think the initial zing is attributable to what JAQK Cellars described as a "viscous entry with intense fruit flavors," and the later change of heart can be explained by the "concentrated fruit flavors and tannins" that "resonate together leading to a long finish." So indeed, the reaction in my mouth was not so far from what I should have expected! Mr. Dees thoughtfully referred to this wine as "Thanksgiving in a bottle" from its heavy taste and profound nature as it pairs really well with the spices of rosemary, thyme, and sage--traditionally the flavors of a classic American Thanksgiving dinner. You can pick up this bottle at Bacchus for $52.99. The seventh wine of the night (7, above) was the 22 Black, a 2007 Cabernet Sauvignon from the Napa Valley. The grapes are hand-harvested with 11-30 day macerations and gentle handling, spending twenty months in barrels with minimal manipulation. The wine's name pays homage to the roulette scene in the classic Hollywood film, Casablanca. Even the wine bottle's label uses the design of a roulette wheel (shown with the roulette ball, with all the luck in the world, landing on 22 black)! Humorously, JAQK Cellars also esteems 22 in this wine's name for it is the atomic number of Titanium, contained in the stealthy F-22 Raptor, the no-win situation of a Catch-22, and the number of bones in your head. According to Mr. Dees, this is the wine brand's steak wine. The three of us, at this point in time, noted this as our favorite thus far (with one remaining) for its smoothness as well as its powerful flavor without being overly heavy while maintaining a nice, full balance. Because she loved it so much, Jess picked up a bottle of the 22 Black before we left. Bacchus offers this Cabernet for $34.99. The last wine in the tasting flight definitely lived up to its appropriately chosen name. The High Roller (8, above) is a 2007 Cabernet Sauvignon from the Napa Valley, and as I've mentioned before, it is the wine company's flagship wine. The grapes are hand-harvested, and the wine uses small-lot fermentation, a 4-day cold soak, traditional techniques using modern tools, attentive extraction, minimal manipulation, as well as a blend of maceration times ranging from fourteen to thirty days. More specifically, the wine is "fined with egg whites, then aged in French oak casks in the tradition of the smooth, elegant Bordeaux-style Cabernets," a process that is typically much more difficult in the U.S. than it is in France. But the result is "a more complex, more flavorful, more balanced wine" and a wine that ages really well, all justifying its premium cost. Even the design of the bottle is regal and worthy of being called a "high roller" wine--a poker chip physically incorporated at the heart of the bottle! To ensure optimal aging vessel, JAQK Cellars chose the king of vessels, the mighty Impériale, which is custom made in Milan, Italy. Surely, this was our favorite of the night. At first taste, I got a really full, round flavor of peach. The wine's taste, and aroma were all elegant and powerful (as all high rollers should be, haha), indicating great aging potential, as noted by JAQK Cellars. This awesome, mind-blowing wine is sold at Bacchus for $74.99. I couldn't resist purchasing a bottle, that I promised Jess I would share it with her on her birthday in May as a birthday gift! We are so psyched about opening it in two months! 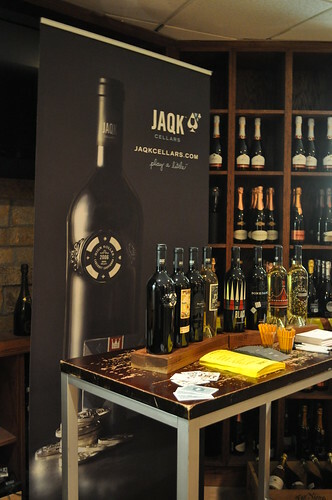 The center table within the tasting, showcasing the eight spectacular bottles of wine made by JAQK Cellars, along with tasting notes and purchase slips. Jess and me nearing the end of the wine tasting at Bacchus. The wine company even makes their own decks of playing cards (how awesome), and I was able to take a snap shot of the company's name spelled out in playing cards above! 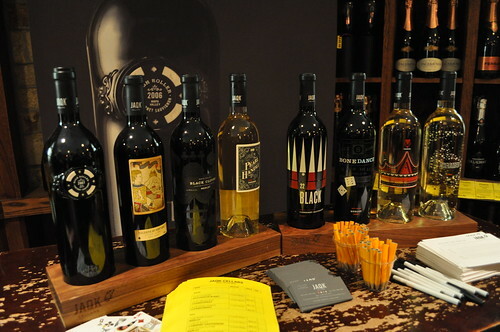 The block of four wines on the left represents the company's Napa Valley / Sonoma Coast collection, while the block of four wines on the right represents the company's California collection. Findings: The three of us had a grand old time at Bacchus meeting the people behind JAQK Cellars as well as being able to taste all eight of the wines! Now I know for sure that great wine can follow great design! I'm one of those people who will nine out of ten times judge a bottle of wine by its "cover" (i.e., its label) without making sure the wine is deemed to be "good" or not, unless I already know the wine is good from previous experience or by recommendations. It's probably not a great way to choose wine, but I'm not going to lie--I like something pretty to look at while I'm enjoying a glass of wine in good company. In every case, JAQK Cellars may very well blows all traditional wine makers out of the water because the level of innovation, thought, and passion by its founders and designers (all in the same here) is simply just astounding. The added level of "play" makes the experience with these wines more modern and enjoyable, without all the pretension typically experienced in the wine world. The quality of wines made simply blew me away, and now JAQK Cellars will forever be a wine brand I will return to for future celebrations and toasts. 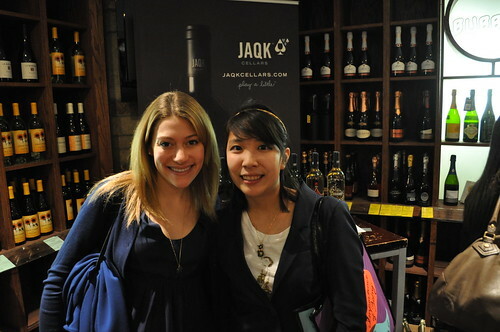 Thanks to JAQK Cellars for coming out to New York City to share and promote the brand! 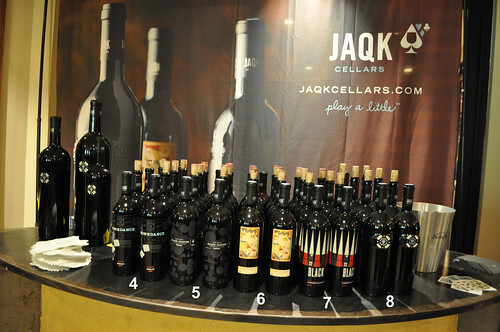 Price point: wine tasting, free; JAQK Cellars wines ranging from $26.99 through $74.99 at Bacchus Wine Made Simple. The bottle designs are so clever! I know! And the taste of the wines are great, too! We're so glad you could make it and taste our wines, and even more glad that you enjoyed it so much to include us in your blog. Thanks again from everyone at JAQK Cellars for your support and enthusiasm. Cheers! Thanks, Kelsey! It was so nice to finally meet you--hope to see you in San Francisco in May!